When we chose to seek out a chiropractor my son had chronic ear infections, a recent diagnosis of autism, and his behavior was getting worse. 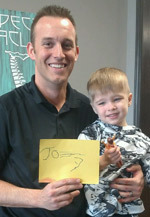 We started at Howell Chiropractic, and my son has made huge changes in the short amount time we have been going. His health has improved tremendously and is rarely sick, he is much more open to peers and loves all of the staff. He even lets Dr. Travis hold him which would’ve never been an option before! On top of him being more healthy, he is saying about 30 more words since he’s started his treatment plan! My son is sleeping through the night almost every night now, and has only had one ear infection in 6 months. He used to get about 2 per month, and has had two sets of tubes. It really has made such an impact on our lives, and I would recommend Howell Chiropractic to anyone! Super first visit!! My children loved their time so much that they couldn’t wait to see Dr. Travis and his friendly staff again. Easy start to chiropractic care along with understanding it. I couldn’t be happier with Dr. Travis and will always refer him to others. If you are waiting to try chiropractic care… don’t! It’s definitely been a life changer for me! 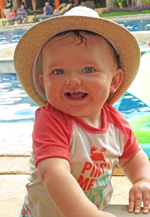 I was pregnant, miserable with sciatica, and the baby was sitting in all of the wrong spots. I wish I would have known about dr Travis while I was pregnant. I started with chiropractic care a week after my daughter was born. I honestly didn’t think my body could be “put back together”, but dr Travis took the challenge and definitely did the job! So glad I made the choice to start chiropractic care, my only wish is that I would have done it sooner! Oh yeah, he does wonders with babies as well. I have the most well natured, balanced baby.. I attribute most of that to regular chiropractic wellness visits! Dr. Travis is amazing at what he does! My little guy started seeing him and getting adjustments a little over a week ago and the progress I have seen already is incredible. From writing his name on his own, to being more verbal, and trying new foods are just some of his improvements so far! I only wish I would have known about Dr. Travis a year ago! It was a very great experience! He did wonders for me and my children after our car accident and they were so welcoming. We absolutely love how kid friendly it is and how they treat you so well! I was very skeptical about chiropractic care but am so glad we decided to come to Howell Chiropractic. My son has level 2 autism spectrum disorder and we have tried several therapies individually but didn’t see much improvement until we added chiropractic care into our mixture of services. The staff is wonderful and Travis works very well with children and adults. We meant Dr. Travis and his staff at the Epilepsy walk. Since then we have taken our son to see him. He is great and well trained to work with children. His staff also helps keep kids happy and calm. It is also a place I can take my children while I get adjusted. I recommend him to anyone looking for a chiropractor. Dr. Travis has been a game changer for our family. Two months ago, my son was still mostly non-verbal, was unable to follow directions, and didn’t “play” with toys of people. Fast forward to today, my son sings songs with hand motions, will “go to” places when asked and will “get” items. Another improvement I have seen is his interest in toys and interacting with others. I only wish I would have started chiropractic care for him years ago! My son started with Dr Travis after a not-so-good experience with another chiropractor within a couple visit my son was and is at ease with Dr Travis. Our experience is going well so I decided to get some care as well. Thank you to everyone at Howell Chiropractic! As a second time mom I didn’t want compare my daughters. I want my youngest to be her own person, so I started thinking maybe she was just a bit behind her sister in terms on head control so I brushed it off. Then my mom instinct was telling me something wasn’t right. Dr. Travis did a presentation of my mom’s day care association and my cousin had taken his son to him for a care management plan and I had seen his result’s but I debated on if my daughter’s issue was developmental or something more. I decided it couldn’t hurt to get checked and made the call to set up our first visit. The staff was amazing and I felt at home as soon as we got there. 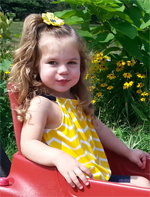 After RaeAnn’s scan was complete we could see she had a subluxation in her neck that was a result from a hard labor. Dr. Travis took his time explaining what was wrong, how it probably happened and how we could fix it. After one adjustment my daughter started latching better while nursing, after 2 visits we started to notice better head control, and after going for 2 weeks she will now turn her head to the left in her sleep something that she wouldn’t have done before. I’m glad that we have found Dr. Travis and he is able to help our little girl out. She will be 4 months old on the 28th. My son is 11 years old and has been diagnosed with ADHD since he was 4 years old. He has been on medication to help with the ADHD symptoms. However, the medication only helped him with his impulse control for a part of his day. He still had a lot of problems at school and he would have long emotional tantrums. He would also have a lot of problems falling asleep at night. He would want to eat a lot of food when he was supposed to be asleep. Since starting a subluxation plan at Howell Chiropractic about 4 weeks ago, he has been able to stop many of his emotional outbursts quickly. He has been eating more during the day and no longer needs 5 big snacks before he can go to sleep so he has been falling asleep very quickly at night. Also, the environment at Howell Chiropractic is very welcoming and kid friendly! We love it there! I was skeptical at first, especially because of what seem to me to be dubious claims about what chiropractors can treat, but I am seeing great results for my back pain. I’m so excited to begin my care journey with Dr. Travis Howell and his staff! I look forward to the appointments and am very optimistic that my health, and the health of my children, will improve with him in our lives! 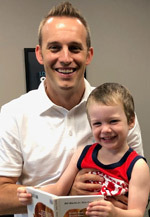 Dr. Travis has such a wonderful scope of knowledge not only with pediatric chiropractic, but in the way he handles kids struggling with issues. I found his practice through a workshop called “The Perfect Storm” which focuses on children with ADHD, sensory processing disorder, autism, etc…and was so impressed by his knowledge, attitude, and passion for helping children with these issues that I knew I had to bring my son to him. We’ve struggled with SPD and ADHD from a very young age….and I am confident in Dr. Travis that he will do all in his power to help my son find balance and make his body work for him as well as it can while dealing with these issues! We have appreciated the warm and welcoming atmosphere for not only our son, but his siblings as well. Our son LOVES coming to the office for an adjustment and not long ago was petrified of chiropractic care. We are hopeful that over time we will see improvement and have a happier, healthier little guy. Dr. Travis conducted a very thorough evaluation before adjustments were made. Exactly what I was looking for – a long term plan instead of just a quick fix!! Office is very kid friendly. Huge plus! It’s a laid back atmosphere which makes it easier to communicate. The technology is impressive and Dr. Travis made the process simple and easy to understand. Thrilled To Have Our Son Under Your Care! We are thrilled to have our son under your care! He has been asking to see his “Super Hero” doctor. That’s always a good sign! We are very optimistic as parents that he will have a great outcome. Thanks for everything you do for him! Your smile says it all! My girls love going to Howell Chiropractic. The kid friendly office and the staff are amazing! Awesome first impression. Excited to return weekly for care! I highly recommend putting your health care in the hands of Dr. Travis! Dr. Travis has been very instrumental in helping me reduce my stress level, with routine adjustments. The exam reveled what areas we needed to work on together for me to become healthier and improve my quality of life. Dr. Travis’ knowledge of chiropractic and his commitment to the health of his patients is inspiring. Dr. Travis is great! He uses state of the art technology to help pinpoint the areas that are causing you pain and helps explain the process of relieving that pain. He also makes it very comfortable to go to the chiropractor. I highly recommend Dr. Travis! Very great to hear from a down to earth doctor. – Heather & Tom D.
Before chiropractic care my daughter was on five medications for epilepsy and having multiple seizures every day. In the three months she has been receiving care, she is now off of three of the medications and her seizure activity has decreased to only having a few mild seizures a week, which is huge! She is now living life more like a normal 3 year old, whereas before she was always tired and never wanted to do anything but lay around. Most people think of chiropractic care as being for aches and pains. Chiropractic care is a whole lot more then that! It helps trigger your body into self-healing rather than need the use of medications to heal or make you feel better. It has given my daughter her childhood back and can help others get their active life back as well! Dr. Travis is very friendly and shows that he really does care about how you are feeling. He also explains everything in terms to help us understand what he is doing and what is going on. Chiropractic care is not something that I would have thought of to help with my child’s epilepsy. I am so glad that we made the decision to seek care. I don’t know why we didn’t think of it sooner. With all the jerking and movement that the body does while having a seizure, you could only imagine what it was doing to her spine and body. I am glad we’re able to give her body the natural care to self-heal through chiropractic care. Since my son started seeing Dr. Travis, his behavior has drastically changed. He used to spend most of his time crying and not sleeping. In the last few months he is a much happier baby that enjoys playing on his own and usually only wakes 1-2 times a night. Give chiropractic a shot! Chiropractic care is not something I immediately considered as a solution; I was referred by my sister. We were looking for a natural remedy and feel that we have found it. Dr. Travis explained the “why” behind his care plan and it made sense for our family. What has pleased you the most in the course of care at Howell Chiropractic? I really appreciate Dr. Travis’ attitude. He doesn’t talk to us like we are stupid, but takes the time to answer questions. He has a lot of patients, but knows all our names and takes time to get to know everyone. This is a big change from our pediatrician. We appreciate Dr. Travis and recommend him to anyone seeking chiropractic care. He is wonderful! Our experience so far has been excellent. Dr. Howell has taken the time to thoroughly explain the process, and reasons why our care plan will be beneficial. We have seen a huge difference in Levi’s behavior and sleeping in just a few weeks! 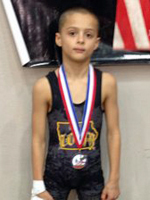 Chiropractic care has been very beneficial for my 9 year old son, who is a very competitive athlete. Not only does he play tackle football and baseball, but he also wrestles 9 months a year, so his body is constantly placed in stressful situations. From headaches, to his body being out of place, to standard care, or to significant sports related injuries, Dr. Travis has been an intricate part of making sure Elijah’s body recovers and heals so that Elijah can perform to the best of his ability.